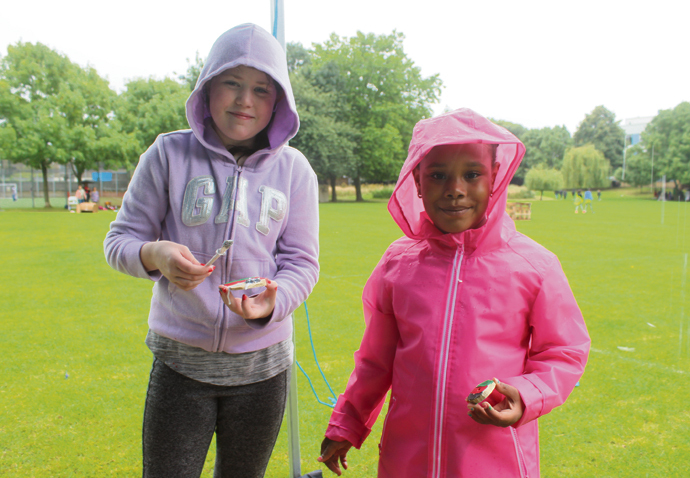 Wednesday August 2nd saw one of the rainiest playdays ever with hundreds of children and families braving the wet to enjoy activities all over Paradise Park. We worked closely with our sister organisation Awesome to create an amazing array of play including a cardboard city, wooden den building , arts and crafts, paint gun war zone, dancing competitions, water rockets and much much more. The day was funded by local councillors through the Local Initiative Funding and supported by Arsenal in the community. We had colleagues from Freightliners farm with a ferret, families information service (FIS) and our stalwart volunteers Christine Lehmann and Tania Parr from Islington council as well as many others. Despite the wash out fun was had, veggie curry from Paradise Park café was handed out to soaking playworkers and children were given free healthy snacks and drinks.